As a result of global warning, it’s getting cooler in winter and hotter in summer, and as such, heating and cooling costs are going through the roof. Thankfully, there is a way you can combat this and that is by simply installing awnings around your home. Having been in the Australian shade solution industry for over 25 years now, I have seen an immense rise in the popularity of awnings. Awnings not only help in reducing heating and cooling costs, but they can also help to protect your interior furnishings as well. Studies have demonstrated that awnings can save up to 26% of energy costs in hot climates, such as what we have here in Australia. This translates into great savings, something you should consider taking a look at. Obviously, you are fed up with your electricity costs for keeping your home cool during summers and warm during winters. Fortunately, by installing awnings, you can effectively battle these costs. Continue reading this article as I explain how awnings can help reduce costs and how they can prove to be beneficial to your home. An incredibly effective form of window treatment, energy.gov reports that awnings can decrease heat gain by about 75% by not allowing air to escape from the window regions. This means that while awnings can help in providing protection from the sun during summers, they also prevent the loss of heat during winters, reducing the heating and cooling costs of a home dramatically. As mentioned earlier, awnings can help reduce heating and cooling costs significantly. Statistics offered by the NSW government reveal that Australian homes spend about $265 every year on air conditioning. By installing high quality awnings with proper window treatment techniques, the use of an air conditioner can be eliminated completely. This can offer great cost savings during the summers. Furthermore, appropriately installed awnings, such as the high quality awnings we provide at Global Shade, will also trap heat indoors during the winters, reducing the heating costs of a home. Awnings are beneficial for summer and winter! During summers, awnings work towards reflecting sunlight away from your window panes. While this reduces visible light, it also works towards reducing heat energy reaching the home and can even work towards protecting indoor furniture from excessive exposure to the sun. During winters, awnings can be retracted to allow solar heat to reach the home and can then be extended to trap heat indoors itself. The awnings we supply at Global Shade help the environment and allow you to rely less on internal heating and air conditioning and they reduce your energy bills. At Global Shade, we offer a range of shade solution products, including awnings. While awnings are one way to reduce the heating costs of your home, treehugger.com also lists some other incredibly simple ways of keeping your home cool, by planting trees and vines around the home, tuning windows, using blinds, painting the roof, using attic and ceiling fans and by cooking hot food outdoors. If you’re fed up with electricity bills going through the roof because of increasing heating and cooling costs, you should consider installing awnings around your home. Awnings are an affordable and effective way of reducing your cooling costs during summers and heating costs during winters. 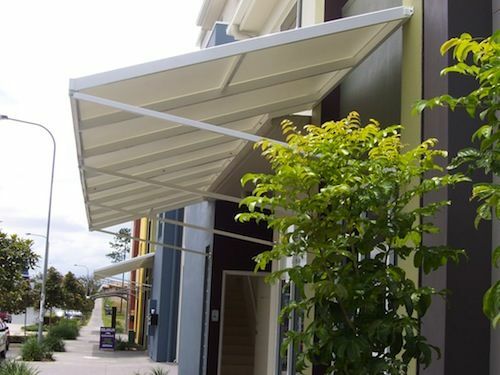 At Global Shade, we offer some of the best fabric awnings in Australia. Our high quality products are also backed by installation support and after sales service, Australia wide. If you’d like to have awnings installed in your home, contact us today. Our experts would love to discuss your awning needs and requirements.